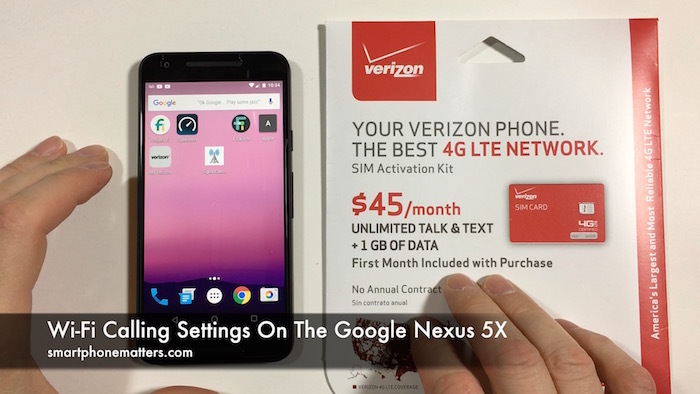 Recently I tried to enable Verizon Wireless’ HD Voice services on my Google Nexus 5X. While I was able to use both voice and data at the same time, I was unable to turn on Wi-Fi calling. After I enabled HD Voice using the My Verizon app I was still unable to find any settings for Advanced Calling or Wi-Fi calling in my Nexus 5X’s settings. I read somewhere that the Wi-Fi Calling on the Nexus 5X works with T-Mobile and we know it works with Google’s Project Fi too so I decided to try a little experiment. I had a T-Mobile SIM on my desk so I put it in the 5X and waited for it to recognize the T-Mobile network. After I did that I when into Settings and under the Wireless & Networks option I looked under more. I did not see an Advanced Calling option but I did have a Wi-Fi Calling option which I turned on. After that I went into the Phone app’s Settings and under Calls I could also see the same Wi-Fi Calling settings and it was turned on. My T-Mobile SIM isn’t active so I can’t try Wi-Fi calling to see if it works, but we can see the Wi-Fi Calling options. Now, I put the Verizon Prepaid SIM back in the Nexus 5x and waited for the phone to recognize the SIM. I then checked under Wireless & Networks in the Settings app and the Wi-Fi calling option was missing. I also checked the Phone app’s settings and the Wi-Fi calling setting was not there either. Unfortunately it looks like HD Voice isn’t supported on the Nexus 5x. I’m sure that Verizon supports HD Voice on the different Android phones they sell but not on Google’s unlocked Nexus phones. What about you? Do you have HD Voice and Wi-Fi calling on your Android phone with Verizon? Leave a reply below and share.